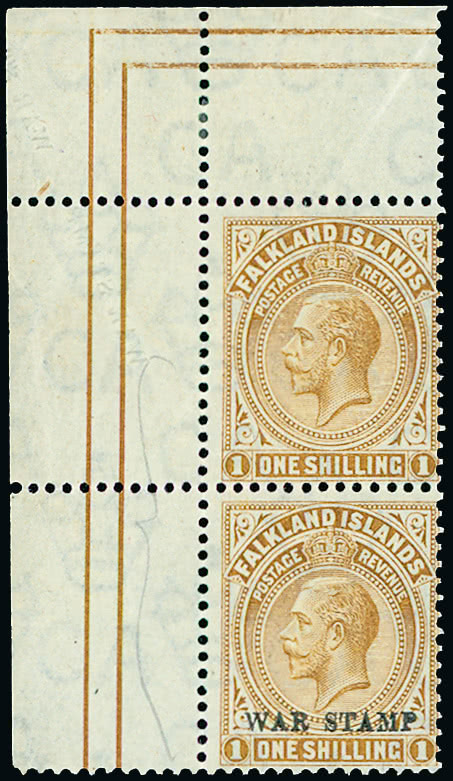 Over 2,200 lots were presented in this sale, the catalogue for which will be another essential reference for specialist collectors of the Falkland Islands, including as it did the outstanding collection formed by Bryant Rose, an early member of the Falkland Islands Philatelic Study Group. Among a well-received section of 1918-20 “WAR STAMP” overprints the front cover item, a corner pair of the 1s. with one stamp missing the overprint due to a paper fold (lot 1723), reached a gratifying £11,052, whilst the newly identified pair of the 1s. from the Fifth Overprinting with one stamp showing the overprint partially omitted (lot 1741) rose to £6,140. An exceptional example of the Black Frank on an envelope sent in 1871 to future postmaster George Travis (lot 1555) achieved an impressive £14,280, the highest price in the sale. A mint block of twenty of the 1898 5s. red, one of the largest known and formerly held in the Koefman collection, reached £4,298. Collectors in the room were outfought by two telephone bidders each desperate to secure the imprint block of four of the 1938-50 £1 Fourth Printing (lot 1832) resulting in a remarkable final price of £3,438. Foreign countries are more poorly followed in the United Kingdom than those of the former British Empire but plenty of interest was received from around the world for the lots created from the Les Skabinsky collection of Poland. A fine study of the 1919 “POCZTA/POLSKA” Overprints (lot 1222) doubled its estimated value at £6,326. Among other interesting realisations, two full imperforate sheets of thirty (frustratingly each missing one corner stamp) of the Queensland 1882-95 2s.6d., printed as sample proofs by Bradbury Wilkinson in lake-brown and rosy vermilion respectively (lots 240, 241) found a new home for £3,808 apiece. A marginal pair of the India 1854 ’91/2 Arches’ 1/2a. vermilion (lot 717), attractive despite one having a central inclusion, climbed to £3,213. A previously unrecorded set (less the 5r.) of Uganda Railway Telegraphs from 1902 and perforated “CANCELLED” (lot 182, at top), a further gem from the De Lacy-Spencer collection, was fought up to £2,618. This auction offered a particularly wide range of material with response varying sharply between countries, providing a fascinating overview of a market in transition. Postal stationery continues to be a poor relation to stamps and bidders were few in this area whilst the response to airmails was uneven between countries. A strong section of Miscellaneous & Mixed Lots again revealed that the offering of a collection intact can often be the most effective method of sale as dealers and collectors again fought spiritedly for possible bargains in a well-attended and busy auction room.